American foreign policy often looks like a trail of man-made debris and disaster. Of course, the explanations for many poorly-made decisions are rather complex. In this brief and cogent analysis, Houghton shows us that understanding American foreign policy often comes down to recognizing the cognitive limitations of the decision-makers, which affects the foreign policy process. Then there is the nature of the decisions themselves. Quite a few decisions in American foreign policy involve ‘tragic’ choices, where leaders are effectively confronted with a series of progressively bad or uncomfortable options. And it is equally clear that some policies are not the product of any one individual’s preferences, but emerge as a consequence of the way in which complex modern governments with large bureaucracies operate. 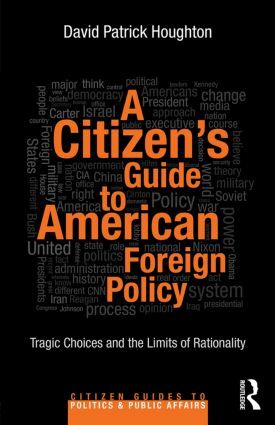 Written with the interested layperson in mind, as well as students of international affairs, this Citizen’s Guide to American Foreign Policy asks questions like, "Why do presidents so often do things which seem to be directly against the national interests of the United States – not just in retrospect, but even at the time?" "Why do there seem to be so many fiascoes in US foreign policy?" "Why does Congress sometimes tie the hands of the president in foreign affairs?" "Why do presidents seem to respond more to opinion polls or to what’s on CNN and Fox News than they do to the core interests of the United States?" Houghton’s overview helps us see past the partisan in-fighting that too often obscures the central issues in foreign affairs. This is vital, required reading for all readers who wish to better understand America’s involvement in the world. Th e Fiasco Factory: A Frank Drebin School of American Foreign Policy? Don’t Know Much about History: What’s the Diff erence between Iran and Iraq, Again? Republicans or Democrats, and Leadership in General: Does It Make a Diff erence? Special Interests: How Special Are Th ey?